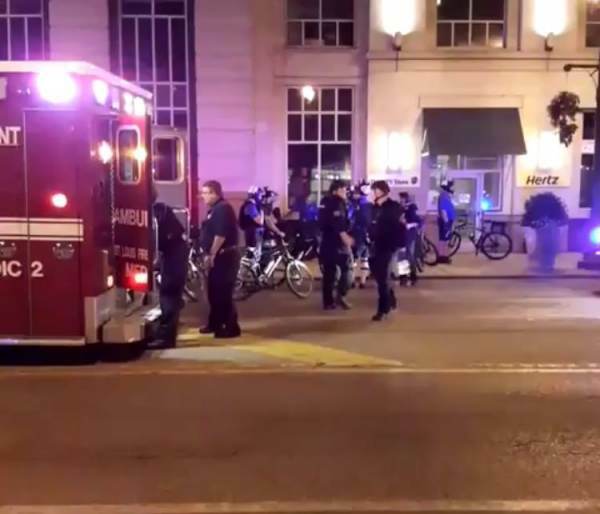 A St. Louis bike officer was transported to a hospital by ambulance with non-life threatening injuries on Sunday night as protests turned violent. St. Louis Police Department went on a tweetstorm updating as the protesters turned violent. Thugs were breaking windows and damaging property as St. Louis protests spilled over into day 3 because of a verdict in favor of a police officer. Multiple arrests have been made. St. Louis Police officer was taken away in an ambulance on Washington Ave.
St. Louis Police say bike officer with a leg injury is being transported to a hospital for treatment. Injuries are non-life threatening. St. Louis Police march in protective gear and threaten to deploy tear gas. Thugs have shattered windows and damaged more property.